During the summer of 2007, we welcomed a very special baby to Dorie’s Promise. 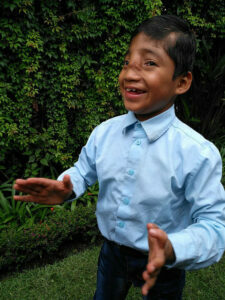 Miguel came to our home as a little boy in need of someone who would love him, despite his many medical challenges. One of the most difficult parts of our job is the unknown we face. Miguel’s story is full of unknowns. As an infant, he was abandoned at a local hospital, leaving us with many questions about his birth family and history. It was obvious he was a very sick little boy with a complex medical condition. Miguel was eventually diagnosed with Holoprosencefaly, a condition where the brain fails to develop correctly. 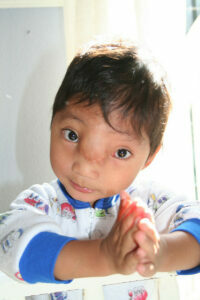 In his case, the condition resulted in severe facial deformities and developmental delays. Over time, Miguel’s body grew but his mind was trapped with limited comprehension and communication. Although he could understand much of what was going on around him, he could not relay his thoughts verbally and instead relied on gestures. Even with his many challenges, our Special Mothers and Doc developed a care plan that helped him progress over the last few years. They identified activities he enjoyed and found ways to increase his abilities beyond what many believed possible. As Miguel got older, we realized that in order to reach his full potential, he would need specialized care beyond our training. We could see glimpses of potential within him but were unable to completely unlock his abilities. 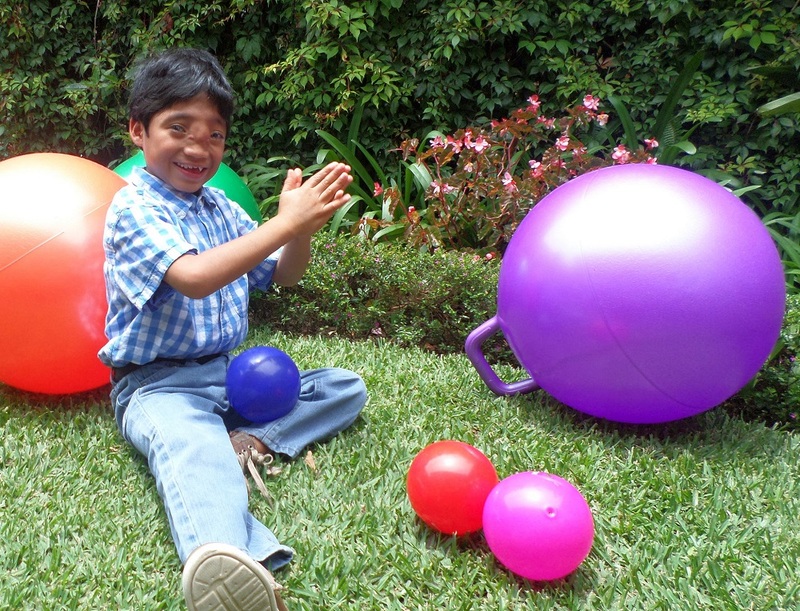 Over the last year, we began researching other orphan care homes in Guatemala who specialized in special needs children. If we were going to consider Miguel leaving, we wanted to make sure he was going to a home where he would be loved and cared for with the same high standards we hold dear. Allowing one of our children to leave is hard and we didn’t want to make a poor choice. Eventually, we found another Christian home specializing in special needs children. Our director and staff visited with them several times, discussing Miguel’s needs as well as their philosophies and standards for care. We are confident this home has both the experience and love Miguel needs to continue growing. Over the last few months, Miguel began making visits to the new home. Neither home wanted to make an abrupt change and risk making the transition more difficult than necessary. Instead, Miguel started making short visits to the new home, making new friends and learning what to expect. Each time his Special Mother would visit with him, eventually allowing him to go play with his new friends and staff without her by his side. During the same time, we worked even harder at home to help him reach some developmental milestones in preparation for moving to his new home. He mastered feeding himself and other personal care goals this year thanks to the help of his Special Mothers. Working together, the staff of both homes set development goals and established a plan for his move. On November 13th Miguel moved to his new home. Thankfully, his new caregivers are giving us updates on his transition and progress. After just a few weeks, he is already acclimated and has new friends he enjoys playing with. Just like in our home, Miguel has already won over the staff, especially his new nanny. She shared that Miguel is doing well, “like he has been here for a long time.” Knowing he is enjoying his new home makes the transition easier for us as well. Although we tried, we couldn’t really prepare completely for the empty place we feel in our home. It’s been especially hard for some of the other boys in our home. For them, Miguel’s departure feels like a family member is missing. We’re hopeful Miguel has good memories of the prayers and special moments he shared with our staff and kids before he left. Two very special women cared for Miguel in our home. Mama Lucia Gonzales remembers when he first came as an infant. For 13 years she watched as he grew, witnessing many of his “firsts,” and building a lasting connection with him. She still remembers the day he took his first steps, as well as the day he learned to feed himself. He amazed her over the years. It never mattered that he couldn’t do the same things as the other boys, Miguel was always happy and friendly. Mama Lucia Gonzales misses the unconditional love Miguel showed to everyone in our home. In his way, he taught her that “love overcomes all.” She’s carrying Miguel’s love with her still. Mama Lucia Ortega remembers the mischievous side of Miguel. Many people underestimated him because of his medical conditions. As a toddler, he loved to open drawers and remove whatever happened to be inside. He even tried to climb into the drawer himself one time, luckily the mamas caught him. He’s such a silly boy. If music was playing in our house, you’d usually find Miguel dancing. Many days, Mama Lucia Ortega would take Miguel on walks, often singing with him as they went. She misses their walks and feels like “part of her is gone.” Her walks aren’t the same without him. Anyone who spent time with Miguel understood how special he was. Mama Lucia Ortega shares how spending time with him taught her that “everything can be solved” if you are patient. It may not be solved how you expect, but everything can be overcome. Watching Miguel make such amazing progress over the last year is a testament to the value and ability of every single child in our home. We’re forever grateful for the time we had with Miguel.